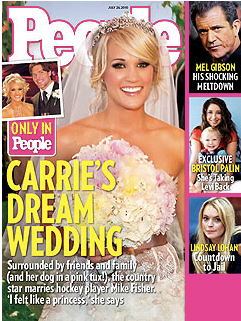 I love Carrie Underwood Fisher, however what do you all think about this wedding dress? I don’t dig it. It looks a little too modern for my liking, and I see her as such as classic chick. Regardless, she looks stunning, and it’s her wedding, so to each her own. Maybe I’ll change my mind once I see the full-length version. Congrats again to the Fishers… not like I know you, but I love you both anyway. Also, Mike is only 6’1”?! I totally thought he was at least 6’5”ish. Can’t wait to get the magazine and read all about their nuptials! Previous PostPrevious Fekkai on E! Next PostNext Co-workers are family you don’t choose and sometimes you like.